I am so sorry to “appear” to be neglecting you and our blog. Honestly, I’m not for I think of you often, and write these posts in my head, only to get sidetracked by some housing dilemma. Fair warning, I will be back with a VENGENCE in the Fall, when I will undoubtly have more time!! Let me get y’all up to speed on what is happening here. I SOLD the house. Well, not exactly sold, the purchase and sale has been signed. So it is not final but it appears that way!! And in this market with the mortgages taking a nosedive, I feel very blessed. YAY!!! I am breathing a sigh of relief since now I can move into my new place without three mortgages looming over my head! I am free to buy yarn again!!! 🙂 After all, I do have my priorities!! Ha ha!! I have 14 days (read it as two more loud weekends) with the neighbors. I’ll talk more about the after we move….just in case they stumble upon the blog!! Am I knitting, YES!! I need to to save my sanity!! I am loving your sewing projects and you just might inspire me to get a sewing machine!!! Oh and I am writing a wee pattern for a knitted camera cozy, and I will post it here….and the cactus as soon as I add the photos to the pattern! So much to do, so little time! So you wanted to know about my 40th birthday gift??? You can read about it here!! I got a day at Cornelia Day Spa in NYC. An entire day of pampering. It was HEAVEN!!! I am buffed and polished smooth as silk now. Ahhhhhh……… In my opinion one of the best presents I ever got! Oh, and while I was in the city, I naturally had to visit a yarn shop!! I was all set to go to Purl in Soho but it was so HOT and HUMID and the thought of standing waiting for the subway in that heat made me want to hide someplace with air conditioning! EVERY time I go want to go there, it is shut, or too hot or too snowy. Someday!!! BUT, I did go to School Products!! What a haul!!! I got pashmina and cashmere (CHEAP!!!) 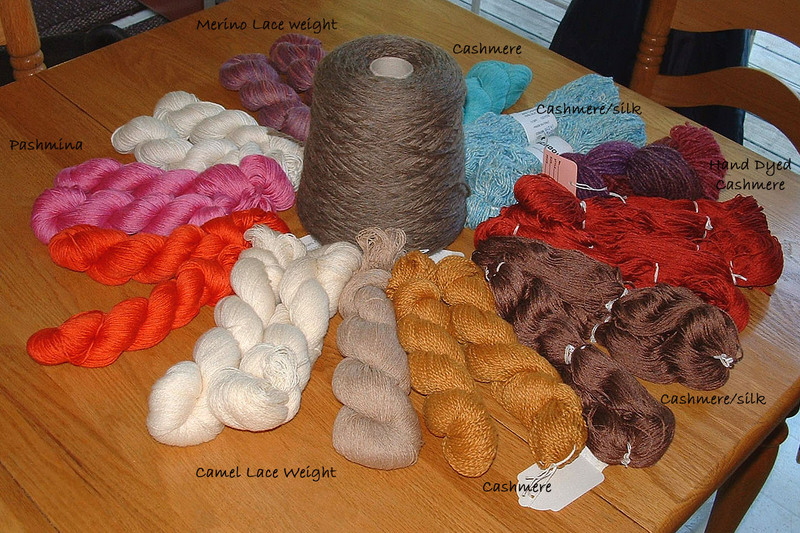 Not pictured is about 1,500 yards of YAK which I have always wanted to try! The sweater she had next to the yarn was so unbelievably SOFT!! I think I am going to make myself something nice. Oh yah, the shopping trip was partically funded by my mother’s birthday gift….cash! So there you have it, my life in a nutshell! I hope you are doing well. Read any good books lately?? ?